This class is offered privately and scheduled at your convenience year round. Come visit The Soap Shed and spend the day in person with us. This one day workshop provides an overview of cold-process soap making geared to beginning soapmakers, whether you are a complete novice or tried a batch or two on your own. To schedule a group class, you'll need a minimum of three participants (and no more than six participants). Additional participants can be added up to 24 hours prior to the workshop for $145.00 each (see below) up to six participants. The workshop fee includes a day with Dr.T, a retired science professor who will provide class lecture, demonstration & supervise your soap production from 9:30am through 4:30pm; lunch, beverages and snacks; all supplies and materials needed for class (oils, butters, lye, fragrances, safety goggles, gloves, aprons, and soap mold to take your soap home) and the Workshop Workbook including classroom lecture notes, helpful online resources, and recommended soap making suppliers. Tim will introduce you to soap making procedures required to make soap from scratch and demonstrate how to make a batch of soap while you assist and watch. While making this batch he will introduce Basic Soap Chemistry and the necessary Safety Precautions you must take when working with Lye (sodium hydroxide); demonstrate how to measure, weigh, and melt your oils, monitor temperatures and mix your soap batch. Soap molds, liners and other necessary equipment will be shown and used. After you have made a batch of soap with Tim, you will make your own first batch of soap - a single Fat or Oil Soap - with Tim as YOUR coach. Then we’ll introduce you to the Processing phase, where we evaluate soap to determine its readiness for cutting, and demonstrate how to use a variety of soap molds, log splitters and different size bar cutters. Your workshop manual will include SAP values for oils and butters you may choose to work with on your own, and resources to help you create your own soap recipes. You will take home your batches of soap in their own travel mold for processing, cutting and packaging later yourself. Your one day workshop is over about 4:30 pm. This general outline can be modified in many ways to meet your needs. If you'd like a second private day, just choose '2' as your quantity during checkout at our website. If you'd like to send your ideas to us via email (info at soapshed.com) or speak to us via phone prior to your registering online, feel free to do so. You'll find a link to our Contact Us form and our 800 number listed in the top right of every page on our website. The workshop will be held at The Soap Shed, Spruce Pine, North Carolina. Tim Tyndall, Ed.D. is a science professor by education and training, having been a science teacher and college administrator for 30 years in chemistry, biology, botany and health sciences. 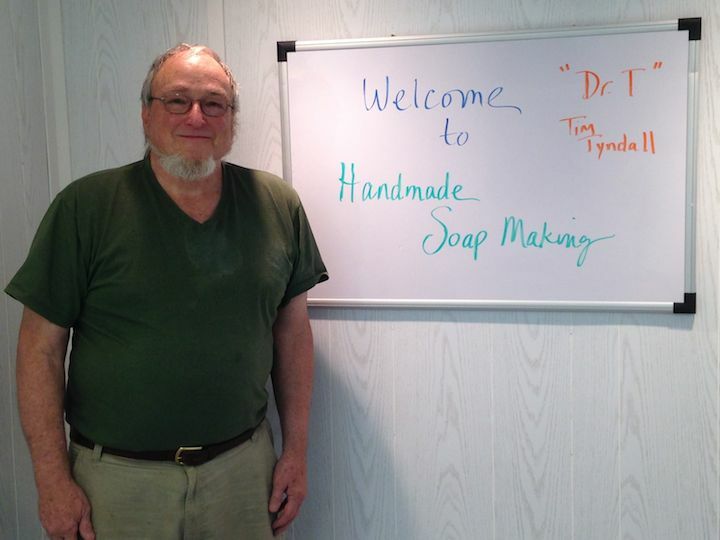 'Dr.T' has been teaching handmade soapmaking weekend classes and week long classes at the John C Campbell Folk School in Brasstown, NC for fifteen years. Karen Wylie, M.Ed., Ed.D. was a business consultant for twenty years before creating The Soap Shed in 1998. Karen manages the sale of Soap Shed soap wholesale, via consignment, at craft shows, multiple retail shops in various locations across North Carolina, and from the soapshed.com website. She also coordinates production, inventory, quality control and packaging. In response to requests for soapmaking demonstrations, The Soap Shed opened its doors to the public in 2000. Located just off Blue Ridge Parkway Milepost 331, during the Blue Ridge mountain tourist season (May-October) visitors can see soap made and select from 150 varieties in the Soap Shed's retail shop. The Soap Shed's current level of production is 60,000 bars annually, or twelve tons of soap. We've grown through many various batch and mold sizes through the years, not to mention websites, suppliers and marketing strategies. We can help you navigate your options at the different stages of growth you find yourself considering. Their unusual backgrounds - combined with their first hand experience in creating and running a handmade soap business for nearly 20 years - provide Tim and Karen with unique perspectives on making and selling handmade soap, and small business start up and growth. You can register for this Workshop by putting it in your shopping cart and checking out here on soapshed.com. You may also pay by check or money order in the amount of $395.00 and mailing it to The Soap Shed, 179 Meadow View Road, Spruce Pine, NC 28777. Please feel free to contact us at 877-404-SOAP or complete our 'Contact Us' form (located on the top right of each page) with any questions you have. And please read our cancellation policy below before signing up.